I wish to share with you a success story behind a genealogical research, which took about 7 years to be solved, just in time when a "lost sheep" from the family decides to come and visit newly found relatives from his newly found grandfather's ZLOTNIK branch. It started 18 months ago, in this forum, when a kind genealogist from Israel, Chaim Freedman looked for researchers of the Rabbi Yehonatan EIBESZCHUETZ and Rabbi ZLOTNIK of Plock. His message was on behalf of his acquaintance, Joseph Zlotnik who didn't have Internet access at the time. We than found out that Joseph Zlotnik is my 2nd cousin, related through the Zlotnik side being the grandson of Rabbi Yona Mordechai Zlotnik from Plock, brother of my grandmother Rasza HOLCMAN nee Zlotnik. Finding Joseph led to finding later Albert Zlotnik and his mishpuche, who is now coming over to Israel, first time in his life, just to meet his new Zlotnik family in Israel. He never knew his grandfather, rabbi Yona Mordechai Zlotnik had a big family (13 sibling) and some did survive the Holocaust and have descendants here and in diaspora, all 2nd cousins of him. We shall celebrate historical Zlotnik family re-union on June 4th, here in Tel Aviv. After getting to know Joseph, I helped him also to seek his grandmother's origins - Hinda Zlotnik, nee Eibeszyc from Zakroczym who perished in the Holocaust together with daughter Nekha. Last heard from was the Ghetto Warsaw. He didn't know anything at all about his grandmother's family, except that she was (as per family tradition) a direct descendant of the great Rabbi Jonathan Eibeszuetz from Altuna (1690-1764). This was my original inquiry, sent on June 98 to Heshell Teitelbaum. "I am searching the Eibeszyc connection of my cousin Joseph Zlotnik, grandson of Rabbi Yona Mordechai Zlotnik from Plock and Hinda Eibeszyc from Zakroczym. Great grandfather of Hinda Eibeszcyc was: Isaac Eibeszyc, who came to Poland from an unknown country on 1823! He was a Hebrew teacher at Plock. He had a son: Israel. Israel Eibeszyc left Plock and went to agriculture and forestry, city unknown but possible Zakroczym. He was Hinda's grandfather. Months passed and various paths led to nothing. The only little progress was while checking the JRI Plock's (for which I have the honour to be Plockoordinator:-) vital records. Our efforts included many emails and correspondence with various Eibeszyc descendants, telephone calls to Copenhagen, a search in Yizkor Books and interviewing elderly people from Zakroczym, the little town in Poland where grandmother was born. I sent Marie Kramer's inquiry to Heshel Teitelbaum from Canada, who has been researching the Eibeszyc lineage for more than 15 years, and is writing a book about this family. He was involved in our research before but without positive results. Only when checking his records for Etta Eibeszyc, did he realize that her sister was Hinda Eibeszyc from Zakroczym, Jopseph's grandmother. concerning your husband’s descent from Rabbi Jonathan EYBESCHUETZ. It was only once you mentioned the marriage of Etta to Rabbi Abraham Naftali Gallante that I knew which family yours is. I already have a small family tree of this Rabbi's descendants. However I had filed it under the town of Rodzanow which is where he was born. I did not realize that there was a connection to Zakroczym and therefore that there was a connection to the Zlotnik family. When I was in Israel about 8 years ago I met a man by the name of Jonathan Chipman who is a descendant of Rabbi Jonathan. I asked him what he knew about his family and he referred me to his niece, Elana, who is the "unofficial custodian of the family history". 1. Abraham Naftali Gallant married Etta EJBUSZYC. 2. Etta was the daughter of Moshe Aron EJBUSZYC and Devorah. 3. Moshe Aron and Devorah had at least 10 children who lived to adulthood. d) Chala EJBUSZYC who married Benzion SILBERBERG. e) Shimon EJBUSZYC who married ? f) Hinda EJBUSZYC who married Jonah Mordechai ZLOTNIK. g) Etta EJBUSZYC who married Abraham Naftali GALLANT. h) Frimmet EJBUSZYC who married Haim KNASTER. i) Yochevet EJBUSZYC who married Leib DEBJINSKI. This is independent confirmation of Joseph Zlotnikw's descent from Hinda EJBUSZYC and that her father's name (hitherto unknown to Joseph) was Moshe Aron Ejbuszyc !!! Elana"s chart also helps to help Susan Henderson who once asked if I knew who her Frimmet Ejbuszyc was (married to Michel Chaim KNASTER). She had given me the name of the town of Strzegowo. Now we know that Frimmet was a sister of both Hinda and Etta. Now that we have identified everybody let me ask you if you know any further back than Etta Ejbuszyc ? Joseph Zlotnik knew that Hinda's (and Etta's) grandfather was named Izrael. And Ada Holtzman figured out from the LDS vital records that Izrael's father was Iciek Ejbuszyc born in 1772 not in Poland. " I extend my deepest thank to Heshel Teitelbaum, who has helped many of the Eibeszyc line in the . God bless him for his tireless devoted research which brings people together and connects lost family members. Thanks also due to JewishGen, for having the Family Finder, for having the email exchange forum, for having JRI on-line and all these Internet research tools. Finally, thanks to Haim Freedman, who did a real mitzva, and a big favour to many people, when sending his message a year and a half ago. We still do not have the family tree deeply rooted into the great Rabbi Jonathan EYBESCHUETZ lineage! How we go on seeking in the mists of the 18th century? 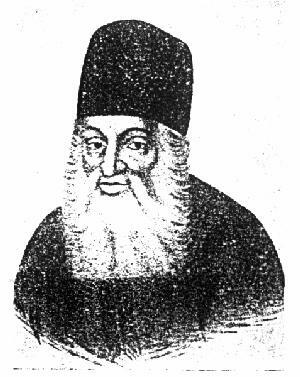 8 years only separate now from Issac Eibeszyc to the great Rabbi who died in 1764. Was he a grandson? May be also one descendant kept a similar parchment of the great rabbi - same as Israel Zlotnik z"l told Joseph? !